January presented itself with a wide gamut of conditions - we finally got some snow (yay! ), then bitter cold, freezing rain and ice (boo!). There were several sunny days where the frost glistened along the path, and rain that washed it all away. Mother Nature tempted us with hints of an early Spring, but I'm not buying into it just yet. 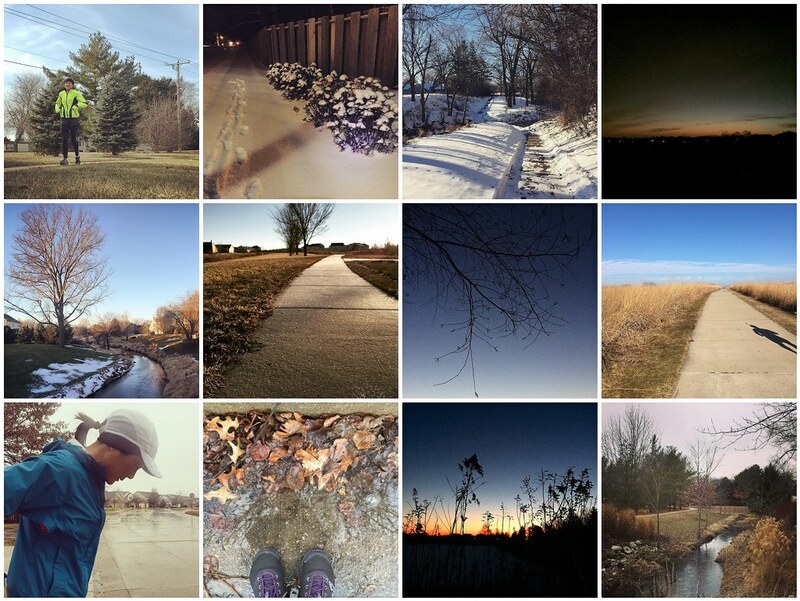 January commenced Spring Marathon training. Like last year, I joined the local running club's marathon training program. And like this time last year, I have not yet committed to running the local marathon. I'm sure I will sign up in the next month, as the training is going well. The training program gives us two options to follow - a beginner program based on Hal Higdon's Novice 2 program, and an intermediate version based on articles from Guy Avery. I [mostly] followed the beginner program for last year's two marathons, so this year I'm going with the intermediate program. Generally speaking, there are more miles, more specific mid week workouts (hill repeats, tempo runs, etc) and runs at "goal pace". This, of course, forces me to hone in on an actual race goal (other than "just finish the thing in one piece and without being sent to the hospital"). I'm always reticent on these goal things - admittedly because I fear failure (not meeting my goal represents failure, even though I know it should not). But, for the record, my goal is to run a 4 hour marathon. Favorite run: This year's first run in the snow, of course! Don't let fear decide your future. Don't try to rush progress. Remember–a step forward, no matter now small, is a step in the right direction. I can never say it enough how inspired I am of your dedication to running and how much I enjoy the pictures that ensue from it. I would be leery of running in the snow, but I am guessing with your location, that is part of the package to your training since you are often not given the option (especially if you intend to stick to any type of routine). You have a beautiful place to run, Shirley. Though I stopped racing and really don't do anything but run/walk on trails now (to build bone, I tell myself), I still love to hear about runners. That Henderson quote is so true - about more than running. Though we need good health and physical stamina, the mind can make all the difference in whether we finish or not (in anything we do). What a great series of shots! You certainly have a lovely place to run! I need to find a quicker way to make collages, I love how they look! Looks like you have s great place to run...I would like to WALK there! Good for you to be training! Love this quote...Don't let fear decide your future. I need to work on that. PS the Honda belonged to my friend, she was comparing it to her previous car too. She was a bit disappointed at our inability to get out of the snow...she is looking into better tires!